Set an alarm on your phone or waterproof watch to apply sun cream again just in case you fall asleep. Limit your time in the sun - I regularly moved my sunbed in the shade at hotter periods of the day. Put sun cream on at least 15 minutes before going outside. Hot weather can cause dehydration so drink plenty of water. Make sure your sun cream isn't out of date. Sun cream should be reapplied straight after you've been in water – even if it says "water-resistant". 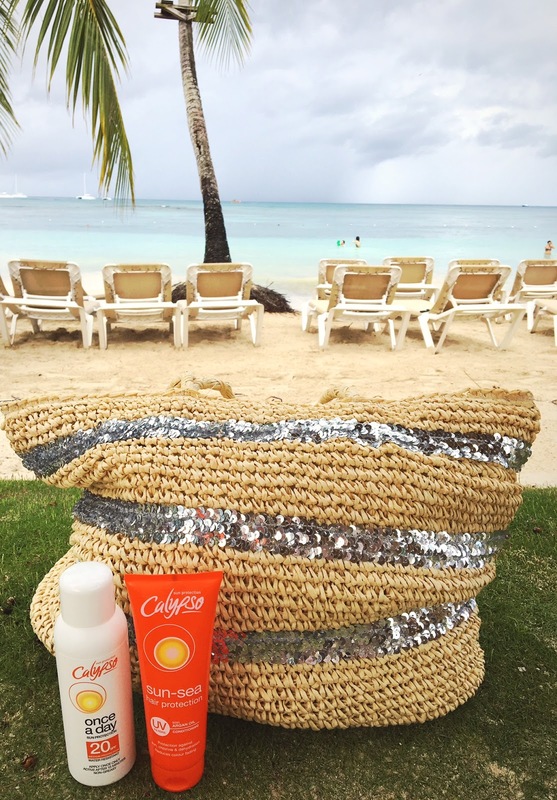 I was recently gifted the Calypso Once a Day 20SPF product for my holiday to the Dominican Republic. Having used some of their other sun products before (body care or your local supermarkets are cheap places to purchase them) I was eager to try out their one a day because there is nothing worse than feeling relaxed and then having to get up and ask someone to reapply it for you again. On my third day in the Caribbean I did burn on my chest and back a little bit which is usually where I burn on all of my holidays. The reason for this is that I was sitting in the poolside bar for three hours talking and should of reapplied having been exposed to water for a long time. Also I have never been on holiday to the Caribbean before where the sun is very hot compared to other countries. I should of started the holiday with a higher factor like it says on Calypso's helpful climate destinations chart. Overall I felt the product protected my skin from the sun, I loved the feel of the product on my skin - smooth and not thick like other sun lotions and it was non greasy like it says on the packaging. Another Calypso product that I had never tried before was their sun-sea hair protection with argan oil. I don't know about you but when I go on holiday the sun makes my hair go lighter, very dry and frizzy especially when exposed it to the chlorine in the pool. I used this calypso hair product right after my shower and brushed through my hair. I must admit it worked great, my hair was way less knotty and frizzy then usual and felt really soft. *The calypso products were gifted to me, but all views are my own. 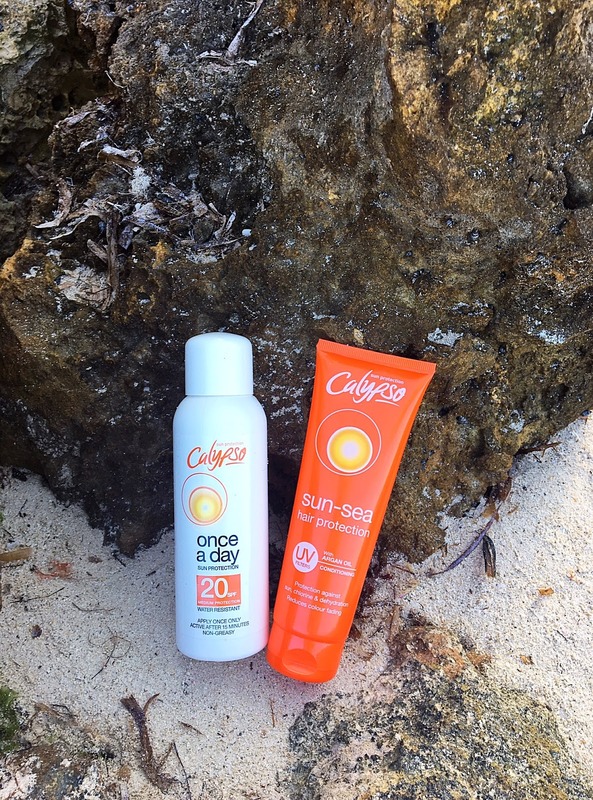 Have you ever used Calypso sun products? I have never heard of hair protection, definitely have to look into that! Great tip about the eyes, that's something I neglect. A tip to ad, SPF for the lips and scalp!! Those are the places most people forget and can get skin cancer on easily! Thanks for sharing! It's also important to remember that the water and sand can reflect the sun's rays. So even if you're in the shade, you might need sunblock! I haven't heard of those sun products, but will keep an eye out for them. Haven't thought about checking the expiration date either! Great tips. Great tips! I love the beach, beautiful shots!